A world filled with billion characters, none like the other. A lifetime full of zillion experiences, no two anywhere similar. So much to see, so much to listen, so much to explore, so much to learn. From social causes to poker parties, from old memories to new beginnings, it's all here....my blah blah. Paapi Pet ka Sawaal Hai! So here they are, a few more details about Bintan and Banyan! The follow up post to A Long Due Family Holiday - Bintan - Part 1. After alighting from the ferry at Bintan island in Indonesia, it took us around 15 min to reach Lagoi, the area which boasts of the manicured resorts. The rustic Bintan, with the local touch is further away and houses some resorts as well. We were stationed at Banyan Tree, and our train didn’t really take many stops :-). Simply put, we hardly ventured out after we checked in! That was the plan. We were looking for a relaxing break. We had no intentions of making our toddler march up and down the streets of Bintan either. To add to it, the nearest town is a small one, Tanjung Uban, which is a 35 min drive one way. We were told that there wasn’t much to do there. The larger town, Tanjung Pinang, where one could go to for shopping and experiencing the local life, is a 1.5 hours drive away. In a short stay of two nights, the 3 hours on the road seemed like a waste of time. Time which could otherwise be fruitfully utilised, and how! Did I tell you yet, that our package included unlimited spa treatments? You heard that right! One of the best spas you could go to, and without any restriction on the number of times you’d want to. (A significant amount of what you’ve spent you recover right here ;-)). A good massage takes away all your physical stress and truly relaxes you, or as some chic chicks might say, ‘cleanses your system’ :-). Didn’t matter that I was walking in at odd hours, finishing after 11 in the night! As for the mental stress, its washed away by the tranquil and the amazingly beautiful sea. And the views are simply stunning. Right from the view at the beach, and from within the resort, to the one from your own villa. In fact there is no trace of land beyond your verandah, just soothing serene waters. Whatever the remainder of the stress, was taken care of by the laughter and cheer of Master A. He thoroughly enjoyed, frolicking in the pool, playing on the beach, running around in the open spaces. Yeah but when the night would fall, he would get a bit homesick. The peace and the quiet, that is so much of a refreshing change for us adults, can get unnerving for kids though. That's the only catch. But but but, the bank of memories that we built up with the short trip compensated for everything else. If he could voice his feelings, I'm sure Master A would say the same too. One such fun experience was our elephant ride. That is one thing no tourist ought to miss. In a nearby resort, you get an opportunity to ride on the back of an elephant. A trained elephant is as gentle as it could possibly get. He’s adorable! Carrying the weight of the mahout and a passenger around, he gently gives you a stroll through the jungle. My two year old was seated in the front of the mahout, with just one hand of the mahout around his waist. The elephant strolled along carefully, and ensured there would be no jerks or jumps. He posed for photos and fed off our hands. I was a bit hesitant when putting my hand in his trunk, but there was no stopping Master A. He went on and on until his friend was completely satiated :-). That was another highlight of the trip, the food. I have to admit, I was very skeptical about Indonesian food, right until my Bintan trip. (For no reason in particular.) Two days in Indonesia, and I must say, they really deliver good flavours on the table! So much so, that I chose to eat some Indonesian fare, even when presented with unlimited choices for the buffet breakfast. The food in general at the resort restaurants was really good though, whether it be the continental stuff or the Thai curries. Since we didn’t explore the local culture, we missed out on the rustic local dishes, something you could give a shot to. But yes, on our way back from the elephant ride, we had taken a stop. Here I picked up Pandan bread. Now, pandan bread is widely available in Singapore as well. But again for some strange reason, I had never tried it! Here’s what it looks like. Yep, its green. 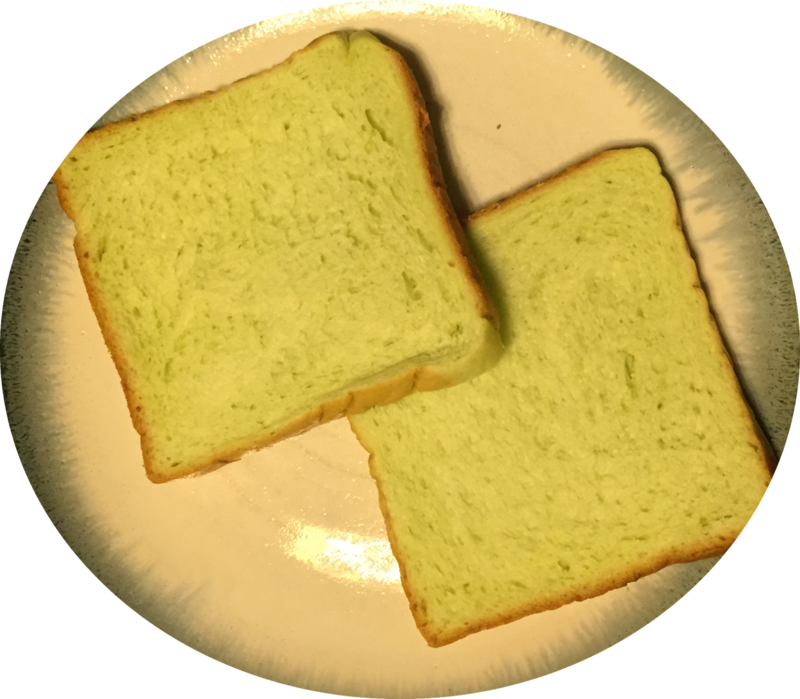 That colour comes from pandan leaves whose extract is used in the bread. It’s a soft fluffy sweet and fragrant Indonesian bread. Something you should surely try when you are visiting South East Asia. That’s enough of a long story about our short break :-). Here is the recipe from one of the sous chefs at Banyan Tree, Chef Ridwan. Its an Indonesian rice recipe, which goes by the name of Nasi Goreng. Nasi Goreng – sounds pretty exotic right? What it simply means, is fried rice! There are non-vegetarian versions, but this is a vegetarian one. This was a delicacy. Honestly, I couldn’t believe this recipe could be so simple. But it surprisingly is! Maybe top quality ingredients and the water there work wonders together, who knows. The fact remains, that with a few ingredients, the chef did toss up something which converted me from an indifferent being to an avid admirer of this cusine. So here it goes. From the kitchen of Banyan Tree Hotels to yours, my friends! Heat oil in a wok. Add onions and saute them. Add vegetables and cook. Add the rice, soy sauce. Mix well. Season with salt and pepper. It is very necessary that the rice be a little old, preferably leftover rice from the day before. Going to try the recipe. Wow Leena I cud actually imagine the serenity and fun during ur Bintan holidays. Wish I can go der sometime as i also love such peaceful places. N yes m gona try dat recipe too..
Sonal do plan a holiday soon! Being a foodie first things first.....vil try the recipe bfre I start plg my holiday. I liked the fact that your vacation meant qlty tym with Agustya...and what better than the elephant ride. I hope my next travel plan will be focused on your frirndly suggestion. Personally, I find the massages and spa treatment a bit of a hype. It relaxes me for that one hour of treatment but within 12 hours I am back to my previous state of mind. Also, strangely when I am on holiday I enjoy it for the first couple of days and then I start missing the buzzing city life - so I can emphatise with Master A! Once you have kids, holidays are more about spending time with the kids than relaxing, to capture those moments in the camera and then reminisce about when the kids have grown up and show the pics to your grandchild, etc. Some of the best holidays I had were my school holidays when I used to stay at home play badminton with my friends early in the morning, read comics during the day, watch cartoons or movies during the afternoon, go down to play with my friends again in the evening and then read my science encyclopedia book in the night before going to sleep. I didn't have to think about the next academic year, career, etc but truly be in a free state of mind. These days we use holidays to reflect on our career, what to do next, etc which can make it anything but relaxing. Also smart devices these days kind of make it a bit more difficult to relax. The recipe looked easier than the pav bhaji recipe! And nothing can match childhood fun yaar, whatever we may do, wherever we may go! Even the simplest of things we did back then made precious memories! What better way to spend some quality time away from the city, near sea, with unlimited spa and amazing food. At the end of the day a healthy refreshed mind is what we all look for. I wonder if I can visit this place someday.. Thanks for landing there at my space..
And you never know, you just might end up planning it someday soon! I am happy that you three could spend quality time together. All the more glad to know that Master A loved it. Good you tried local dishes as well. This is always there in my list when i plan my holidays..
Haan re Haan Haan 50 50 – With An Award! Albert Pinto Ko Gussa Kyon Aata Hai! All written content on this website is the copyrighted material of Leena Walawalkar. Reproducing the same elsewhere shall require written consent of the writer.